It was an evening with more ups, more downs and more controversy for the Rockstar Energy Racing squad in Indianapolis, Indiana. 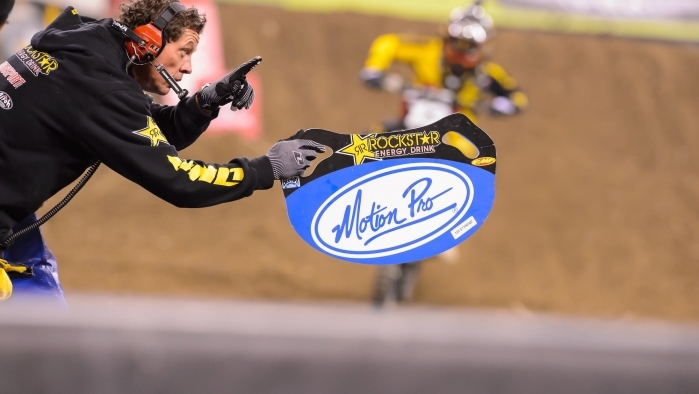 What seemed to be shaping up as a stellar Supercross night went sour at the end of each main event. It's funny how perspectives change. There were a lot of positives to take away from this weekend's performances, although the results were hard to swallow emotionally. The good news is that the team definitely has something to build on going into Toronto next week. Davi Millsaps looked great all day. Starting with the final 450 qualifying practice where he posted the 2nd fastest lap time, only a couple of hundredths out of 1st, and nearly a full second ahead of 3rd. He then celebrated a successful heat race finishing in a respectable 2nd place. Millsaps' main event began nearly as good as can be with a holeshot, although he was overcome quickly by James Stewart as the pack exited the first turn. He stayed right on the leader, challenging him for position for several laps. Unfortunately Ryan Villopoto was right on Davi's rear tire as well so he was also forced to protect his lines. Perhaps if he got into the lead sooner the night would have ended different but he was relegated to 3rd. On the 20th and final lap Millsaps went down in the corner entering the start straight. He remounted quickly and was able to cross the finish line in 4th. That's where the perspective has changed. A 4th place at Anaheim 1 would have been celebrated. Expectations have been raised without a doubt. Davi's Indy ride was still a good one however and his knee is improving every week. He should have been on the podium but that's racing. There is a very good chance he will return to finish in the top 3 next week. Although Blake Wharton's practice did not begin as positively as Davi's, his momentum picked up as the day progressed. Blake went down hard in a very high speed crash as he collided with Vince Friese at the end of the track's longest straightaway. He was down for quite some time and had to go back to the truck, do some stretching, focus mentally, and regroup. He did just that with an impressive heat race win in front of a stadium that looked to not have one empty seat. Just like Millsaps in the 450 main, Wharton nabbed the holeshot. He did not look back and stretched out a substantial lead for 14 and a half laps. Then when he seemingly had his 2nd consecutive victory in Lucas Oil Stadium all locked up, he went down in the whoops with just a half of a lap remaining. By the time he he got back on his bike, he went on to finish 5th. Then following the race is when the controversial salt was thrown into Blake's wounds. An official protest was filed against him by another team over where he reentered the track. It came down to another opinion based decision. Some would say that due to the safety of other riders and Blake himself, given his position on the track with no access to cut across lanes, that he made the right decision. That however was not the ruling that was made. Wharton was docked 4 positions to 9th. There is no going back in time and the past cannot be changed. He showed he can win a Supercross and must move on taking the positives with him next Saturday. Next weekend marks round 12 and the only international stop of the 2013 Supercross Series in Toronto, Ontario Canada. Millsaps will strive to cut into the 9 point deficit he currently faces. Wharton will try to put in 15 solid laps en route to his first victory of the year.